This NIV Beautiful Word Bible is absolutely stunning! It contains 500 full-color illustrated verses with wide margins, printed on high quality paper. I love that there's a space on each page for notes. Making notes always helps me go deeper into God's word. I also love that the NIV Beautiful Word Bible comes with a built in page marking ribbon making it easy to mark your page for the next reading. 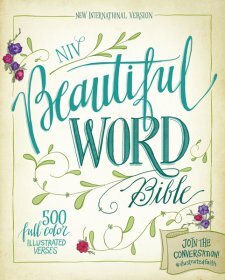 This NIV Beautiful Word Bible is stunning and would make an excellent gift for just about anyone! You can find NIV, Beautiful Word Bible on Amazon, Barnes and Noble and other bookstores.